I had planned to name this post, "Three Really Stupid Ideas," but I've decided instead to write about one really stupid idea and one pretty good idea that will almost certainly deliver less than it promises. As for the other two really stupid ideas, well, you'll just have to wait a few days for those. The Delhi High Court ruled last week that local authorities must once again enforce a ruling the Supreme Court made back in 2000. Though this ruling will affect other industries as well, the Indian Express makes it clear that it is aimed at plastic recyclers in particular. I've been thinking a lot about the plastic recycling industry since I reviewed Of Poverty and Plastic and interviewed its author, Kaveri Gill, last month. If previous experience is any guide, this ruling will fail to bring an end to plastic recycling. It will, however, cause a great deal of needless hardship to people who have enough hardship already. 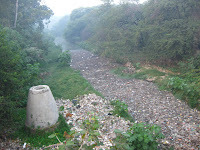 It is common knowledge that Delhi does an exceptionally poor job at managing it's solid waste. There is litter everywhere, but more than that, there are large sections of the city where formal solid waste management and recycling systems are nonexistent. We would literally be drowning in trash if it were not for the informal sector: the waste pickers, the kabadi wallas, the traders and the small recycling factories that do much of the work that the state takes responsibility for in most other countries. This is not a perfect system, but it can boast impressive achievements. India recycles 60-80% of it's post-consumer plastic, as compared with 7% in Europe and 10% in China. 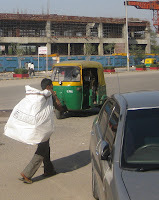 Most of this recycling takes place in Delhi, making our city the de facto recycling capital of the world. The benefits of all this recycling means less use of petroleum, but it also means that poor people all over the country have access to inexpensive plastic products: buckets, mugs, footwear, and more. And the plastic recycling industry has created lakhs of jobs that would otherwise not exist. It is true that the recycled plastic industry pollutes. So does the new plastic industry, and so does burying plastic in the ground. But three points should be made. First, the government has never followed through on it's plans to relocate this industry in a systematic and sustainable manner. If this industry must move, then a well-organized, humane approach would be the way to do it. Second, many factory owners have made efforts to reduce their environmental impact. Sealing them up and scattering them even further from the center of Delhi will simply shift pollution to new areas--where things may be worse. Third, arbitrary and sudden government sweeps like the ones that devastated this industry a decade ago are unlikely to end plastic recycling, but they are almost certain to cause enormous amounts of suffering in an industry that is already marginal and risky in the best of times. Perhaps the justices of the High Court felt they could get away with such a drastic attack on the industry that helps keep Delhi as clean as it is because they've read about the Let's Do It! Delhi campaign, which aims to clean up Delhi in just one day on March 20. A similar campaign worked in Estonia, organizers say! Why not Delhi? I'm sorry, but I think this is such a sweet idea. In fact, Mrs. Batti has me and the kids signed up for some kind of clean up work on that day, and I'm really looking forward to it. You should sign up, too! But I have to confess that every time I hear the Delhi effort compared to the Estonian campaign, I find myself giggling uncontrollably! Please, don't take this the wrong way! I hate litter. I don't litter-- I even pick up other people's litter sometimes, which, I might add, almost always embarrasses my children. But I watched a video about what happened in Estonia, and I just have to break this to you: DELHI is NOT ESTONIA! The Let's Do It! Estonia campaign was amazing. In the weeks leading up to their one-day clean up drive, they used GPS gizmos to map out every pile of trash in the country. The airwaves were flooded with free public service announcements featuring all kinds of famous Estonians. On the day of the clean up, Estonia, a country of 1.3 million people, produced 50,000 volunteers, who cleaned up 10,000 tons of trash. Wow! Those guys are serious about cleanliness! So what if most of that trash went to landfills, not recycling centers--you really have to give them credit for doing an incredible job. The Let's Do It! Delhi organizers are impressive and hard working. They are doing a very good thing. I support them. But no matter how we try, we will not be able to clean up Delhi in one day. To approach the level of civic involvement that the Estonians had, Let's Do It! Delhi would need to mobilize more than a half million volunteers on March 20. To be successful, they would have already had to have mapped every trash pile in every slum and public park, and all the plastic floating in every nallah and river in the city. And, of course, the MCD would have to have laid the ground work for a trash collection system throughout Delhi so that those piles of trash wouldn't just reappear next month. Of course the fact that we will fail does not mean we should not try. But there is too much irony here to go unspoken: this month, as people from all over Delhi come together to spend a day picking up litter, the courts have put at risk the livelihoods the lakhs of hard working men and women who spend all of their days collecting and recycling our trash for us. Let's do it better than this, Delhi! Seems like a short time lead time, but it's good to start somewhere! There's something to be said about changing the culture of not littering. That something that takes years. Now...on to my other comments. On the Let's Do It, Delhi! website you have to register. Which seems OK. Then it says, "No Walk In Volunteers allowed." That seems a little extreme. Are they really going to turn people away/check? Finally, when I heard the campaign was entitled Let's Do It!, my interest was immediately piqued. It was something of a let-down (ahem) to discover this was a reference to trash and not just plain trashy. I could go on, but this is a family blog. @Plastic--I think it would be great to change to culture of litter. It would help to have more public trash cans available. That makes a huge difference. It would help to make sure solid waste management systems exist everywhere, not just in the nice parts of the city. Those are not trivial issues. But if you can mobilize someone to come out and actually clean up some trash, then that person is going to be less likely to litter in the future. Re, the title of the action, it might be an issue of translation! The lets do it delhi campaign for march 20 was only about cleaning Bhikaji Cama Place. This day was quite successful as 900 people picke up 5-6 tonnes of trash. The one day clean up of Delhi is slated for September...which gives time to prepare for it like it was done for estonia. Delhi is definately not Estonia but there's no reason a different model for Delhi cannot be built which is adapted to what is different about Delhi. thanks for setting the record straight on that. I think it's a great project and it's clearly been a success so far. I think we'd all agree that Delhi presents massive challenges that weren't faced by Estonia, but who knows? Maybe it can work here. I do think we need to do a better job of valuing the people that are doing much of this work already: the kabadi wallas, the waste pickers and the informal plastic recycling industry. As important as volunteerism is, we can't keep the city clean or green without those people. They make us the recycling capital of the world! Let's be proud of that. My feeling is that any efforts to clean up Delhi will fall short of what happened in Estonia if they don't prioritize clean up of the areas that are under served or un-served by our current system of solid waste management. I just read on the Let's Do it Delhi website that the next effort will be "a ward, a circle and a slum", which is great. Hopefully the people who live in those areas will be participating. I wonder how easy it will be to maintain some of these efforts, because in many places where poor people live the state does not do the job it should of providing solid waste management services. So unless something shifts in those areas in terms of services--or unless the people living there take ownership of the cleanup--the trash may just come back. But it's important to not give up because it will be difficult. Thanks for stopping by, and hope to see you again. Let's Do It Delhi is an interesting initiative and it raises important issues. I believe their objective is to involve the local occupants and others too. They had a 60percent requirement for volunteers being from within the complex itself. The rest could come from elsewhere. They plan to create workbooks and act as enablers to assist occupants in cleaning up their areas. Great model...they are focussing on 3 aspects..littering (awareness), existing litter (one time cleanups) and sustainibility. I dont think Delhi will be superbly clean after September, but I think it will make a difference. A huge difference. High time issues like this are addressed. @Anon, I've been impressed with the organization behind the campaign. I think litter is bad and we should clean it up. I support this effort, as long as it doesn't turn into an effort to sweep dirt under our collective rug because we've got a load of tourists coming to Delhi for the CWG. Along those lines, I hope we don't forget the people who do so much of this work for a living: the waste pickers, the kabadi wallas, the plastic recyclers. And I hope we don't think that litter is our only environmental problem--it is too tempting to want to just push unsightly things out of sight. (Bury the litter, hide or move slums, etc.) Inadequate water, for example, is a problem we all deal with--but poor people are the ones who die from it every day. I fully understand that a movement can't solve every problem at once. I just hope this movement does it's share of education about other ways in which Delhi needs to be cleaned up--ways that affect poor people as well as middle class people and tourists. This reply is garbled--I've got a bad stomach today (the water, probably :) ). So glad you stopped by, and hope to see you again! You have raised very valid points. The idea is not to sweep the litter under the carpet but to look for simple, workable and lasting solutions. The waste pickers, the recyclers are a very important of this initiative. If it wasn't for them, Delhi would have been burind under garbage. The movement cannot solve all the problems at once but I am sure it will create awareness amongst and energize a critical mass of people who will work towards and demand lasting solutions. Most of us just cringe at the litter all around and feel helpless. Its time to make a change. And we can. @Anon--thanks for coming back; I've found this exchange helpful.